Iron Cleaner is a program designed to optimize the performance of the Google Chrome browser and other Chromium-based browsers. It helps the browser both in speed and usage of RAM. 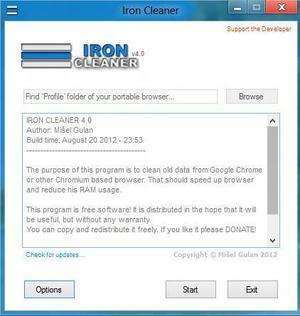 Iron Cleaner tidies up old data from Chrome like temporary files, cookies, shortcuts, certificates and the browser cache. The program generally leaves personal settings alone like passwords, favorites and other personal data..
For security reasons, you should also check out the Iron Cleaner download at LO4D.com which includes virus and malware tests. Additional screenshots of this application download may be available, too. Iron Cleaner has a presence on social networks. Iron Cleaner download been highly rated by our users.